Hayagriva Prabhu, the original editor of Bhagavad-gita As It Is was true to Srila Prabhupada’s words here. 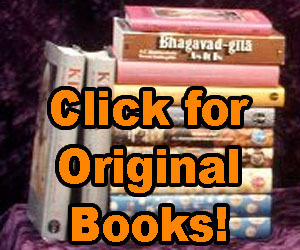 Jayadvaita Swami’s 1983 “Revised and Enlarged” edition is not! Why? And on Jayadvaita Swami’s “annotated scans” which are categorized under “See the changes” on BBTI’s website there are no annotations made to verse 4.11. How did Srila Prabhupada feel about verse 4.11 as it appeared in his 1972 Macmillan Bhagavad-gita As It Is? Do Jayadvaita Swami and the BBTI trustees ever ask themselves this question: If making all of these changes is our way of surrendering to Srila Prabhupada, then what will our reward be? Jay Madhudvisa prabhu! Rascals editors once more defeated! Of course Jayeasyswami is a pure Kali yuga liar, an exemplary cheater a master cheater! How is he closer to Prabhupada! He could be close, so close but he misused the rare opportunity.Anyone who reads those books or support them in any other way must be doomed. I have no doubt. Why not to preserve the books as they are? According to Srimad Bhagavatam they may be composed imperfectly, there is licence given by the Lord to those who are able to transmit the spiritual sound, to the mahatmas. ISKCON became asara as many times as they are changes to the books of Srila Prabhupada!